Creative Movement: For the youngest dancers, age 3. This class focuses on basic movement principles, coordination and also a few ballet fundamentals. 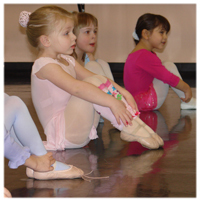 Pre-Ballet & Tap: Level I for students age 4. Involves learning fundamental ballet vocabularyand also basic tap skills. Levle II, for kindergartners, continues these same concepts in a slightly more advanced version. Beginning Ballet: A transitional level, for students in 1st or 2nd grade, this class introduces dancers to a structured ballet class, introducing barre and center work, while also maintainig a few familiar aspects of a Pre-Ballet class. Ballet / Tap / Jazz / Modern: Level I - IV. Placement into these classes will be determined by our instructors, and is based on both age and skill. Ballet & Jazz & Tap students begin these levels at 2nd grade. Students must be in 3rd grade or higher to enroll in Modern classes. Learn more about our Marshfield Youth Ballet Classical Ballet Program and our Jazz Company.